Last year we redid our front yard as the Town had to take down the trees on the curb for a road project. The change from shady to sunny meant all new plants and a new look. 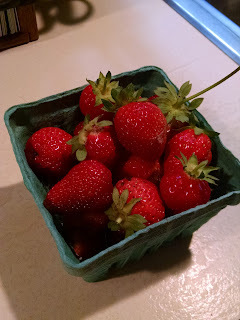 Once everything was planted, on a whim I bought 8 strawberry seedlings and tucked them in between the roses and lilies. Well, those 8 plants took off and now a full third of the garden is strawberry plants. Which have made huge amounts of strawberries. Which have just started to ripen. We've gotten 1-2 berries a day so far, until yesterday. And there are so many more waiting to ripen! I just have to get to them before the chipmunks do. I have a solution for chipmunks......!